The Triabunna mill near Hobart, which has been bought by Jan Cameron and fellow green entrepreneur Graeme Wood. TASMANIA'S timber industry is in shock after two wealthy environmentalists bought a woodchip mill, giving them a strategic grasp of the controversial native forest logging industry. Jan Cameron, founder of outdoor wear group Kathmandu, and online travel entrepreneur Graeme Wood paid $10 million for Gunns' Triabunna mill, on the coast east of Hobart. 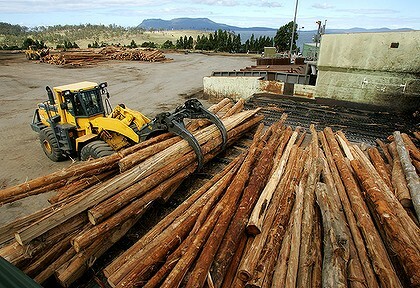 The wealthy pair outmanoeuvred a local logging company to clinch the deal. The rival bidder cried foul, saying its offer was worth an extra $6 million. The purchase could bring a game-changing shift in the native forest logging debate, putting the pro-environment pair in a powerful position. Ms Cameron and Mr Wood are closely allied to green groups and strongly opposed to native forest logging in Tasmania. Under a proposed peace deal between the federal and state governments, up to 430,000 hectares of forest would be protected in exchange for some continued logging. Gunns said yesterday the mill sale agreement provided for it to be leased to an industry operator as a woodchip export business - satisfying a condition of the interim peace deal that says the mill stays in the industry. Premier Lara Giddings said woodchips sent to Triabunna provide vital secondary income to sawmillers and veneer producers in southern Tasmania. But while Ms Cameron confirmed the mill would continue operating for an unspecified period during the transition out of native forest logging, she and Mr Wood have indicated that its long-term future will be as a tourism destination. "It's a very unexpected development for both of us I think," said Ms Cameron. "We don't have any certainty about what's going to happen." She said the writing was on the wall for the native forest logging industry, which has lost key Japanese buyers because the wood is not sustainable under international certification. News of the purchase was broken on ABC radio to the amazement of the rival bidder, the O'Connor family's Fibre Plus. "To give the woodchip mill to two of Australia's richest people … for a $6 million discount compared to what they were asking from us is gut wrenching," Ron O'Connor said. "Our industry is dead and finished without the mill." Fibre Plus was two weeks over a deadline to complete the purchase from Gunns, despite obtaining approval for a controversial state government loan. Analyst Robert Eastment, of IndustryEdge, said it appeared Gunns, which is on a debt reduction drive, opted for the certainty of Mr Wood and Ms Cameron's offer. Mr Wood has been under media scrutiny after he gave $1.6 million to the Greens in the last election campaign. Mr O'Connor said opposition to his family's bid by the Greens and independent federal MP Andrew Wilkie had made raising finance difficult. "The four major banks are very scared of their image," he said. Environment Tasmania said it believed Triabunna could be part of a lasting forest agreement. "We continue to be committed to working constructively with unions, timber contractors and the timber industry to deliver that," said director Phill Pullinger. The Forest Industries Association of Tasmania said the purchase had created confusion, and that without Triabunna's continuation, the peace deal would have no standing. 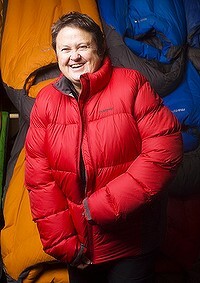 Ms Cameron is one of Australia's wealthiest women, with a fortune estimated at more than $300 million after she sold out of Kathmandu in 2006. Mr Wood's fortune, made from the travel reservation site Wotif.com, has been estimated at more than $370 million.